Most baking recipes that call for bananas require them to be very ripe. 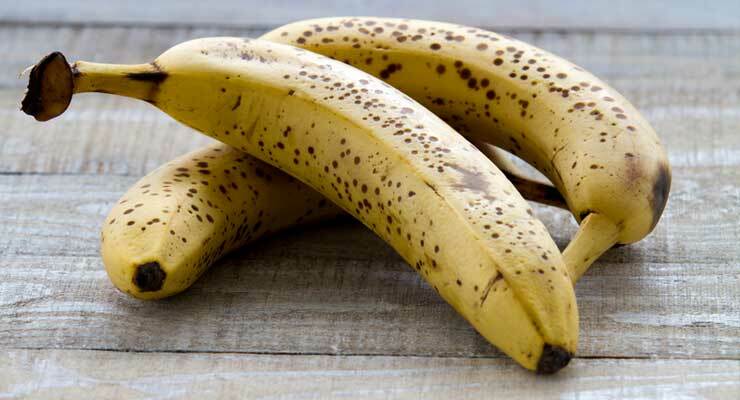 If you don’t have time to use your bananas when they reach this peak ripeness, try freezing them for later! Then you can make delicious banana bread, muffins, or cake any time. Read on to learn how to properly freeze, defrost, and bake with bananas. 1. Peel and slice bananas, then spread slices evenly across a baking sheet and pop in the freezer. When the slices are frozen, place them in a plastic container in layers separated by parchment paper. 2. Peel and mash bananas, then transfer the mash to a plastic freezer bag. Smush it down until it is spread out and flat. Don’t forget to get the air out of the bag before freezing! 3. Freeze whole bananas in plastic freezer bags. Leave the peels on to protect the fruit from the cold. 1. If you froze your bananas in slices, simply remove the amount you need from the container, then set out on the counter to thaw. 2. If you froze your bananas mashed, set the bag on the kitchen counter to thaw. If you need them to thaw quickly, run the bag under hot water. 3. If you froze your bananas whole, let them thaw five minutes, then use a knife to remove the peels. Let the unpeeled bananas thaw completely before using in baking recipes. If you need them faster, microwave the bananas for a minute or two. 1. Make a breakfast and snack favorite: banana bread! Mash the completely thawed bananas, then mix with sugar, flour, baking soda, eggs, butter, and milk. Pour batter into a loaf pan and bake at 375 degrees until a toothpick inserted in the center comes out clean. Banana bread is a more nutritious alternative to toaster pastries or donuts for breakfast on the go. 2. Try banana cupcakes! Mix thawed and mashed bananas with eggs, sugar, baking powder, butter, vanilla, and flour. You can also add cinnamon or chopped nuts to the batter. Pour batter into cupcake tin lined with fun liners and bake at 350 degrees for approximately 20 minutes. When cupcakes are cool, frost with cream cheese or chocolate frosting. 3. Put a twist on a classic with a banana pudding cheesecake. Mix mashed bananas with milk and vanilla, then add cream cheese, sugar, and eggs. Pour mixture into a springform pan, place that into a water bath, cover in foil, and bake at 350 degrees until center is set. Cool the cheesecake in the fridge before serving. Want to give your little ones a healthy snack? Yogurt-Covered Strawberries!